How to delete all photos from the iOS 7 camera roll WITHOUT importing them? simple want delete them directly in the iPhone (iOS 7). What is the "Apple way" of doing this (usually) simple thing? Now you can tap individual thumbnails one at a time to select them, or you can tap the word “Select” that appears at the top of each grouping to select an entire grouping. This solution does not work on iOS 7 (last tested on iOS 7.0.4). It is probably a bug. Click the red icon to delete the photos. Works on ios7 - Plug your iphone into your computer and open it via My Computer - then find the photos file(s). Select all and then delete! Done! Not the answer you're looking for? Browse other questions tagged iphone iphoto ios . How do I delete just the videos from my iPhone? Can I transfer photos that are not in my iPhone's camera roll to my computer? How can I delete all my photos on my iPhone on Windows? 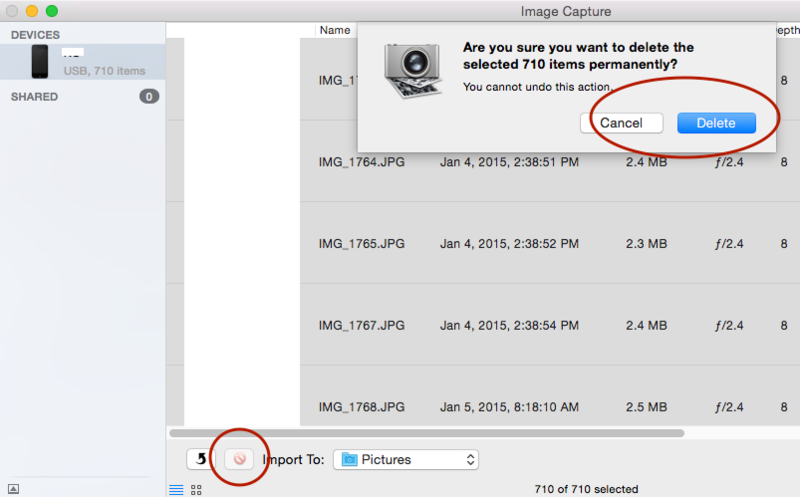 Can I delete photos off Camera Roll after transferring to iCloud? How can i put selected images from photos app on macbook to the camera roll on iPhone 5? Safe to delete the pictures from the camera roll, without them being deleted from iCloud drive?